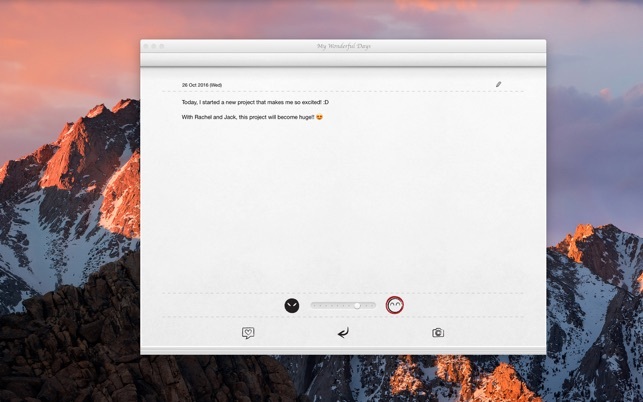 - One of the best iPhone/iPad diary app is now on Mac App Store! 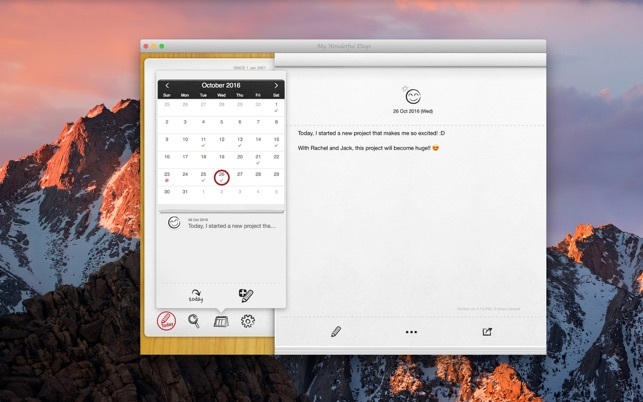 - Full screen mode & retina display support! - My Wonderful Days is a diary you can easily write on. Full of analog features, fully supporting iCloud(2-in-1 iPhone+iPad universal app sold seperately on App Store), searching, photos and a lot more. Get it now on this surprising price and start your wonderful days. - One day has one face :: When we look back at our days, memories about one certain day normally start with one feeling. Whether it was good or not. Then if it was, how much? My Wonderful Days was made to remember our days by simply swiping how you felt today and putting in how your day was. 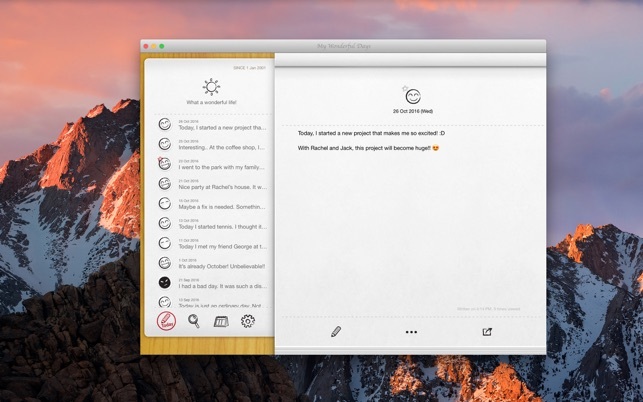 - Notices on time to write a simple note without any load, which makes a great habit. - Passcode to protect your private words. - Photos to put in a note, and some stickers. 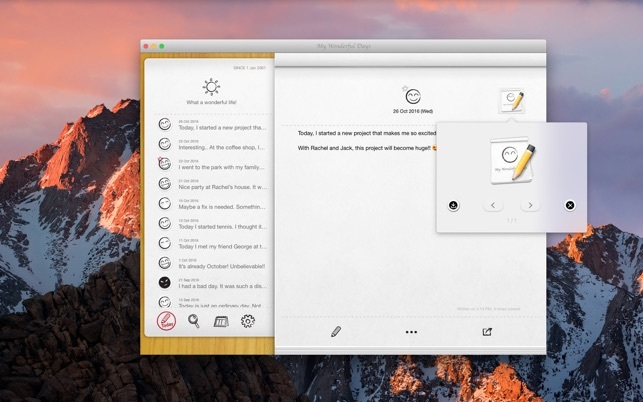 - Text Formatting with bold, italic, underline, highlight and more. - Special days can be starred. It can be seen seperately on search page. Also sorting by happiness, mostly viewed and more can be done to take out memories easily. - To make it feel like your own journal, sound has been added and the papers on notes you've seen many times gets old. - You can see wonderful statistics of your own. - Air Print your entries and keep your days on your hand. - iPhone and iPad universal app is available on App Store. Automatically syncronizes data through iCloud. I’ve been using MWD for four years now for my journal and I love it. So easy to use and there are many options for privacy and sharing. Recently there was a problem with the app and the support was swift and throrough. I highly recommend the quality and versatility of this product. I bought the iphone and mac versions to sync with iCloud. But only the iPhone/ipad syncs with iCloud. The Mac version does not sync with iCloud. I have followed all the instructions but it still does not sync with Mavericks OS on the Mac ! !